An emerging technology has the potential to turn toxic red mud into useful soil, combatting the expensive rehabilitation of red mud dams across Australia. The University of Queensland Sustainable Minerals Institute's Associate Professor Longbin Huang is leading the research and development of an eco-engineering technology to make soil–like growth media (or engineered soil) from red mud. Associate Professor Huang said the process, which was being tested in field trials at alumina refineries in Australia, had the potential to transform expensive red mud rehabilitation practices at Australian and overseas refineries. "Currently, hundreds of millions of tonnes of bauxite residues or 'red mud' are stored in dams at refineries in Australia and overseas," he said. "Large amounts of caustic soda remain in the red mud, making it extremely alkaline and salty. "Plants are unable to grow in this red mud, meaning it cannot be rehabilitated directly and cost-effectively. "This represents a massive economic and environmental issue for refineries, not just in Australia but also in other countries such as China. "Economically, it is very expensive to rehabilitate all red mud ponds into sustainable ecosystems." The research has started with a two-year field-based trial at Gove in the Northern Territory, supported by almost $600,000 from Rio Tinto Aluminium (RTA). With promising findings from a six-month pilot project (worth about $100,000) jointly funded by RTA-Yarwun refinery and Queensland Alumina Limited (QAL), QAL will invest more than $1,000,000 in the soil-making technology in a large field-based project commencing in June 2018, which will benefit red mud rehabilitation at both QAL and RTA-Yarwun in Gladstone. "These eco-engineered 'soils' could be applied in several refinery locations on a large scale to fully test their success," Dr. Huang said. 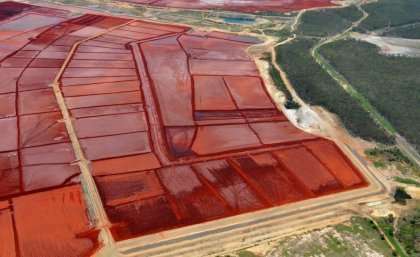 "If these technologies prove successful, it could transform the way refineries are able to manage these red mud dams by turning them back into useable land, and significantly improve economic and ecological sustainability of the aluminium industry in Australia." Bauxite mining and alumina refinery are economically important to the Australian economy, as Australia is the world's largest producer of bauxite. In 2014-2015, Australia exported about 20 million tonnes of bauxite worth nearly $1 billion, and produced 19.9 million tonnes of alumina worth more than $20 billion—with nearly 80 per cent from export earnings.